Lovely, remote, rugged, unspoilt Maria Island off Tasmania's east coast is another Tasmanian walking heaven. Fine scenery (crag to forest to beach), vegetation and animal life combine to make this an outstanding natural walking area. Day walks abound: 3hrs to Cape Boullanger; 2.5hrs to the Painted Cliffs; 4hrs to Bishop and Clerk (a hill! ); and 7hrs to Mt Maria (the highest point), all from Darlington. The four day Maria Island Walk is relatively easy walking in the best of the island's scenery, staying in a tented camp and an old homestead. 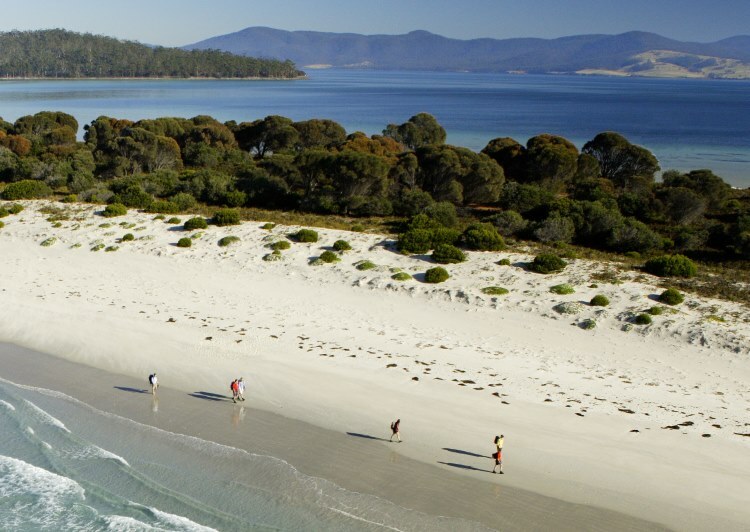 For more information have a look at the Maria Island Walk website, or on Great Walks of Australia. Walk in the summer months. ANYONE GOT ANY COMMENTS OR GOOD PHOTOS? WE WOULD BE DELIGHTED TO POST THEM! See our Tasmania page for more general and practical information.